In order to use Basic authentication, you need to enable "Password access" in Zendesk. Follow steps below to do that. Navigate to your Zendesk and switch to Admin area. Switch Password Access to Enabled. Now, when you've enabled basic authentication in Zendesk, lets configure integration in Bugsee. Start Bugsee integration wizard and select "Basic authentication" in the first step of integration wizard. Click "Next". 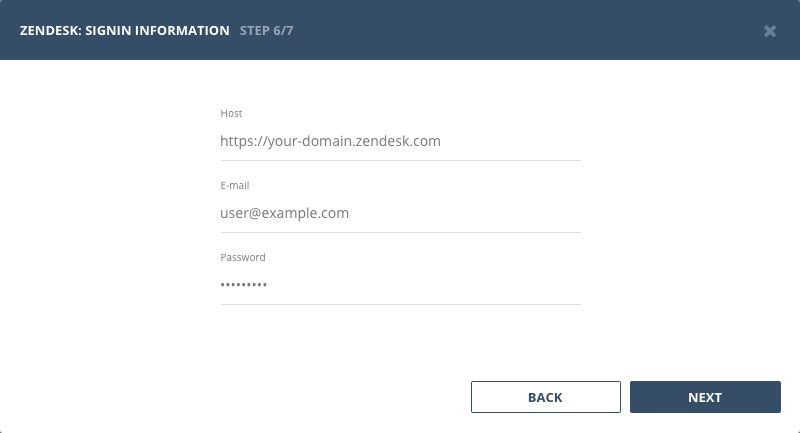 Provide valid host (URL to your Zendesk), username and password. In order to use Personal tokens, you need to enable "Token access" in Zendesk. Follow steps below to do that. Switch Token Access to Enabled. 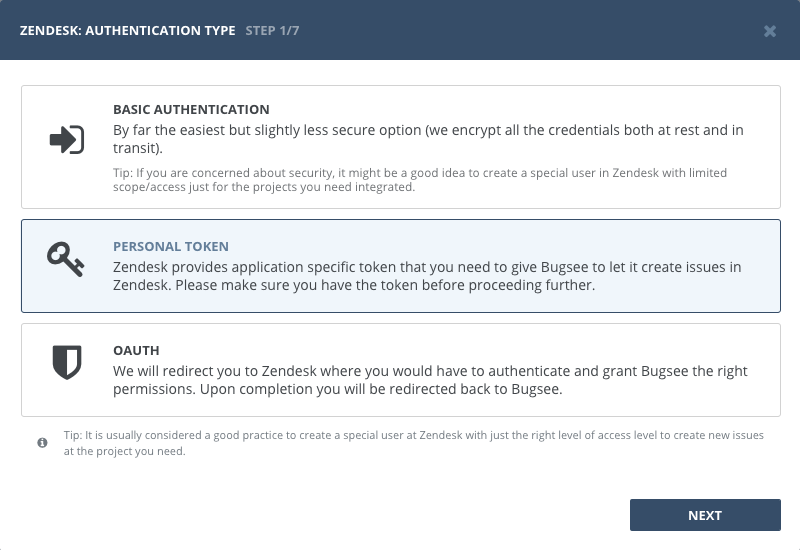 Now, when you've enabled token access in Zendesk, lets configure integration in Bugsee. Start Bugsee integration wizard and select "Personal token" in the first step of integration wizard. Click "Next". Provide valid host (URL to your Zendesk), and paste your token. Click "Next". 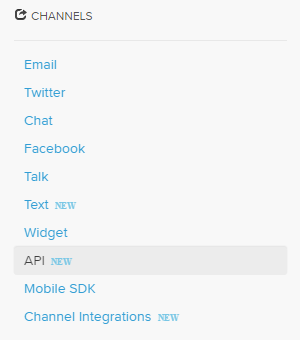 Select "OAuth" in the first step of integration wizard. Click Next. You will be presented with dialog asking you to authorize Bugsee. 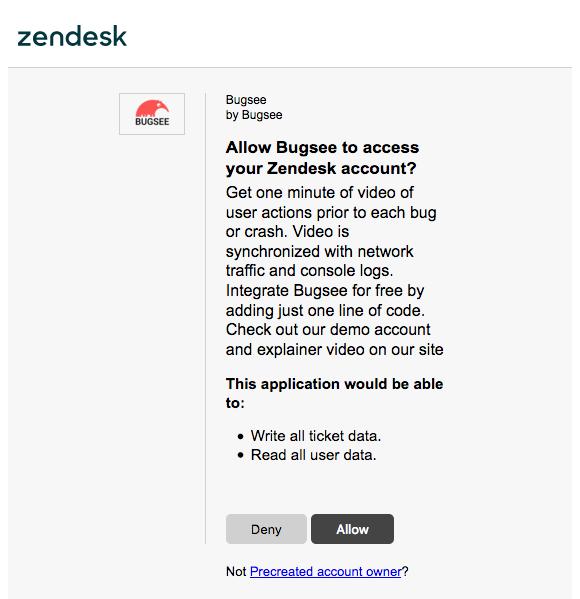 Click "Allow" to allow Bugsee access your Zendesk. There are no any specific configuration steps for Zendesk. Refer to configuration section for description about generic steps.